Australia, where the sun never stops shining and the party never ends. Not content with bringing you the best places to party in Europe and Asia, we’ve now moved our party list Down Under with 10 of the best places to party in Australia. Undoubtedly the coolest place to party in all of Australia, Melbourne is where you go if you want a little culture with your Carlton Draught. Visit Fitzroy and you’ll be surrounded by some of the finest street art, dive bars and live music known to man. Start off with a few beerskis over at Bar Open, hit up Night Cat or Cherry Bar for some live music then end the night (or morning, is it?) with a boogie down at the Laundry Bar. If you’d rather stick to downtown Melbourne, then give Emerald Peacock a look or head to Section 8 for its cool little outside area. Definitely pay Ponyfish Island a visit too – it’s in the river, for Christ’s sake! Of course, you can’t ignore the beach, not in Australia, not even in Melbs. Head out to St. Kilda, brave that ever changing weather. When you’ve had enough, bounce into the Esplanade Hotel and start the party all over again. Boom! Our party hostel pick: As one reviewer put it “Base was the best party is town every night of the week”. Yup, it has to be Base St. Kilda. Sydney is like Batman to Melbourne’s Joker, an epic intercity rivalry that stretches on into the ether. While Melbs probably wins on the creative front, where Sydney does undoubtedly win out is its beaches (and beachside bars). Undoubtedly the most popular seaside spot is Bondi, which will be packed tight with bathers any time the sun is out (which is always). Move inland from the surf just a little and you’ll find the Hotel Bondi and Side Bar (attached to the Wake Up! Hostel) where you’re likely to find countless fellow travellers and locals alike, all well up for a party into the early hours. Once you’re sick of the sand in your shoes, head central. Jacksons on George has a 24 hour license and opens late while Scruffy Murphy’s is just huge and always has something going on. Then finally, looking to compete with Melbourne’s music vibe, the Oxford Art Factory, which puts on some of the best bands from all around, followed by some pretty sweet club nights. Also, keep an eye out for Sydney’s underground parties. 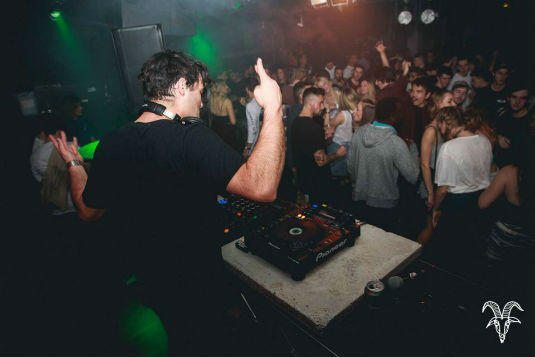 Promoters like People Must Jam, Picnic and Under the Radar put on popular nights in warehouses and venues across the city. Then there’s also the chance of coming across the odd beach party, but these are very secret affairs, so keep your ear to the ground – best to ask a local. Our party hostel pick: Thanks to the Side Bar that sits underneath this hostel, it’s one of the easiest places to meet fellow backpackers and a nice cheap place for a few warm up drinks. Definitely has to be Wake Up! 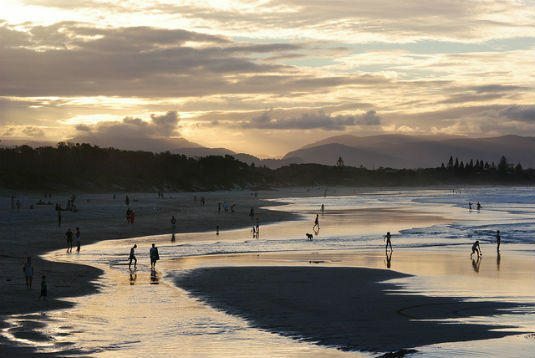 Sydney’s beaches might be great, but they aren’t Byron Bay great. A surf town with cool, chilled hippie-alternative vibes, it’s something of an Australian party mecca. Our party hostel pick: With a 24:7 party atmosphere, pool and located right opposite Cheeky Monkeys, it’s got to be Backpackers Holiday Village. It might not be the classiest of parties, but it sure is one of the biggest. The main party area is centred around the Surfer’s Paradise suburb of the city. There are countless clubs here, all open late and all playing the latest floor fillers, so as long as you like that kind of thing, picking one shouldn’t be hard. If you really want to push it to the limit, join one of the organised pub & club crawls, like Hangover Crawl orWicked Club Crawl. If your tastes are a little more specialist and you want to escape the repetitive sounds of the chart toppers, then seek out the Elsewhere bar. It’s open late, caters solely to the alternative crowd and has a slightly older clientele (aiming for 21’s and over). Although it still spins predominantly dance music, its grungey interior and playlist would still suit the more indie-orientated amongst you. Our party hostel pick: Pool, bar and other backpackers, what else could you need? Surfers Paradise Backpackers Resort. While Airlie Beach is a party town in its own right, it’s the party cruise around the Whitsunday Islands that’s the real draw. The islands themselves are tropical perfection, with white sands and glistening turquoise water, all under Australia’s burning northern sun. With bars on the boats, pumping tunes and even a fun slide, this is the ultimate party that tours paradise. Of course, no one’s quite ready to give in once the boat trip is finished. Most travellers hit up the main strip afterwards for a one-night booze fuelled debriefing before moving on. Favourites include the massive Magnums and the Mama Africa Bar. 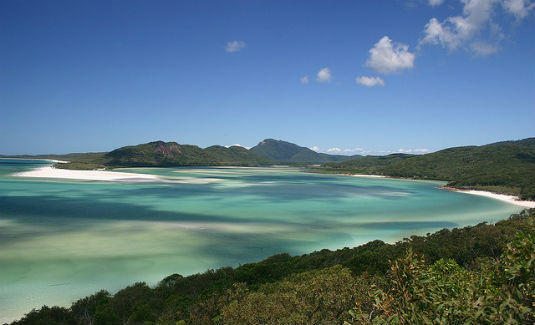 Our party hostel pick: For the Downunder Bar, head to Base Airlie Beach Resort. Named for the magnetic effect it had on Captain James Cook’s compass back when he was busy discovering the great land of Oz, now the island pulls in countless party goers for its Full Moon Party. 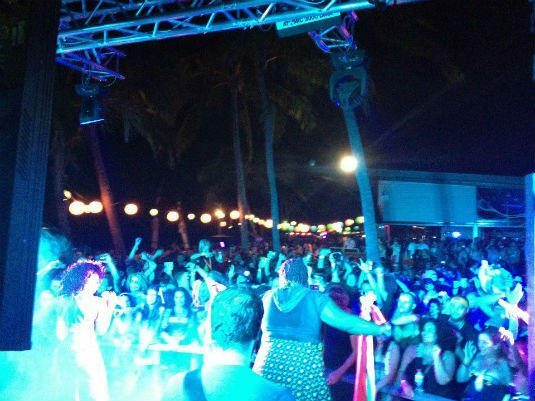 International and local DJs will spin tunes on the beach beside the Base Backpackers Hostel, attracting around 3000 revellers every month, who slap on the body paint and groove beside the fire twirlers until the sun comes up. 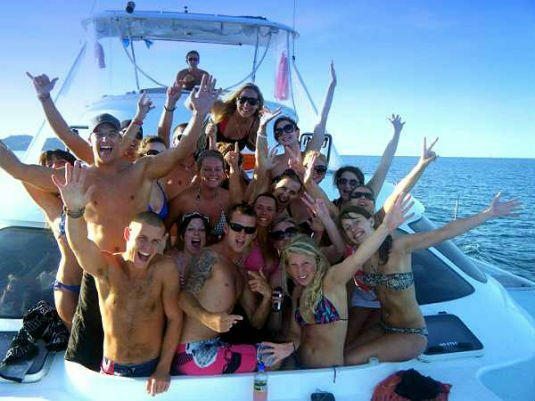 Our party hostel pick: Even outside of Full Moon time, Base is the place to be for a party on Magnetic Island. Located a little inland from Byron Bay, Nimbin is the ultimate hippie town. Although it can be a little sleepy at times, it really comes alive during Mardi Gras. The street are filled with people, colourful costumes and floats shaped like spliffs, as the music blares and the bongos drum. Most definitely worth a look if you’re around during the beginning of May. Our party hostel pick: For its cool, chilled hippie vibe, go for Nimbin Rox YHA. Cairns has some of the best nightlife in all of Australia, especially for the backpacker or traveller on a budget. It’s always worth hitting one of the major hostel bars to start the night with some cheap beers and grub – Nomads, Calypso or Gilligan’s should cover this nicely. Then, when you’re sufficiently watered, head to Woolshed and dance on the tables. Alternatively, join the Ultimate Party Tour pub crawl and hit every popular night spot in town. It’s fine, you can recover while you splash about the Great Barrier Reef. There are worse ways to get over a hangover. Our party hostel pick: We’ve mentioned it before and we’ll mention it again, for a party atmosphere, head to Gilligan’s. Man, it is hot up here – a perfect excuse for a beer, I’d say. Like with most cities favoured by backpackers, it’s best to hit up the hostel spots first. Chilli’s Backpackers has a great, cheap bar and is always packed with travellers from all over the world. Otherwise there’s Shenannigans, an Irish pub that’s also popular with the backpacking scene. Both are cheap, cheerful and will put you in good stead for the night ahead. Once you’re sufficiently socially lubricated, bang on to one of the major clubs. Discovery is Darwin’s biggest, so proves an obvious choice. Our party hostel pick: Chilli’s is always going to be a good way to start the night, so why not stay there? Perth is no longer the isolated and sleepy small town it once was. Now it’s a bustling metropolis on Australia’s quieter but beautiful West Coast, the perfect kicking off point to explore the other half of Oz. Like all major settlements in Australia, Perth is geared perfectly for the backpackers and budget traveller crowd, with countless bars, clubs and backpacker hostels all over the city. An ideal kick off point for a night out is the Barracks Bar at the Old Swan Barracks Backpacker Hostel. It’s one of the best places in town to load up on cheap drinks, line your stomach and recruit fellow travellers for the night ahead. Alternatively you can grab a group and head to the Cottesloe Beach Hotel and watch the sunset over the beach with a few beers, not a bad way to start the evening. When you’re feeling a little silly, look to relocate to one of the city’s numerous clubs.Villa is one if the biggest clubs in town, spread over two levels with three bars, attracting touring DJs from all over the world. Otherwise there’s Amplifier, which is known for its live music in the earlier evening, and dance parties and themed nights once it gets late. Or there The Deen, Perth’s biggest party pub with a whopping nine bars, playing an eclectic mix of electronic and dance music to keep you moving until the morn. Perfect. Our party hostel pick: With its “buzzing” atmosphere, it has to be The Emperors Crown Backpackers.